Background: Loki is a puppy, size XL! He’s been with his owners since he was 2 months old but now they are moving out of country and cannot take him with them. 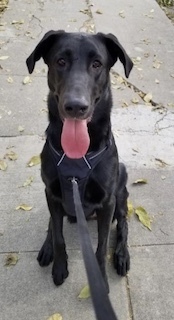 He’s a super nice pup who’s an experienced attendee at doggie day care, loves to play fetch at the dog park with his human (not so interested in the other dogs), responsive to commands (but better with his dad than his mom), and loves to play with his ball. 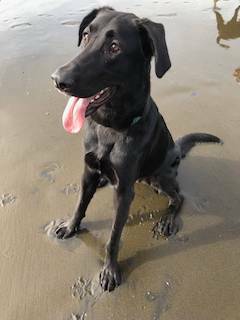 Like most Labs, Loki is going to be puppy-like until he’s 2 or 3, so he’s looking for a home that can continue his training, and give him lots of exercise (a tired pup is a good pup!). Loki is crate trained but will as happily sleep in your bed as in his. 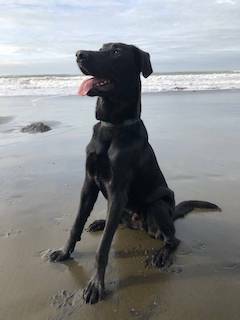 If you’re ready for a whole lotta Lab, Loki is your boy! What Loki’s owner says: If we saw any way to keep Loki, we would. He easily integrates into families and has huge potential to become your highly obedient best friend. He loves swimming, playing fetch (literally addicted to his ball) and tug-of-war. He picks up on new skills quickly, and although he sometimes plays his “puppy-card”, really enjoys being trained. He is an amazing watch dog and his deep barks will keep your house safe. He still has the urge to jump sometimes and is used to getting a lot of our attention (single-dog household). We wish him to be in an environment that cares about him as much as we do and as much as he does for his family. His personality allows for snuggles, cuddles and checking up on you if you ever don’t feel so well. What Loki’s Rescue Rep says: Loki is a sweet, loveable, typically rambunctious Lab puppy. He’s had a good start in life with his current family, and we’re looking for a home for him that will build on that foundation. 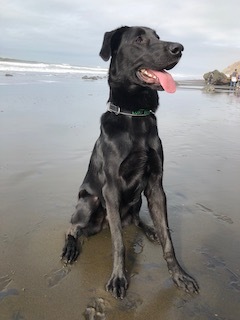 Lots of exercise, lots of training, leadership and the rewards of puppy love are up next for the lucky family who adopts Loki. Loki’s new home should be with experienced adopters (especially experienced with pups), where someone is home much of the day to give him the training and exercise that he needs. Although Loki hasn’t lived with children, we think he’d do fine in a home with dog savvy children at least 8 years old, who won’t be intimidated by his size. Medical information: Loki is neutered, up to date on his shots, heartworm free and on preventive. If you are interested in in the large bundle of love that is Loki, please contact Rescue Rep Debbi at dragonflydebbi@gmail.com (preferred) or 408-309-7830.